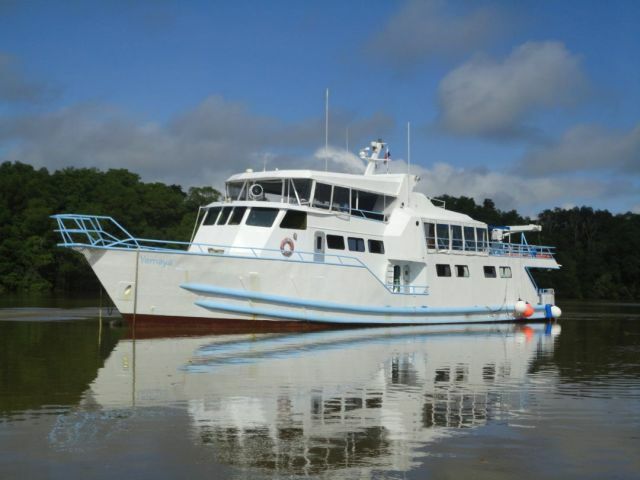 The 35 meter Steel vessel MV Yemaya offers regular, 1-2 times per month, diving expedition to Malpelo and various trips per year to the Coiba islands in Panama. 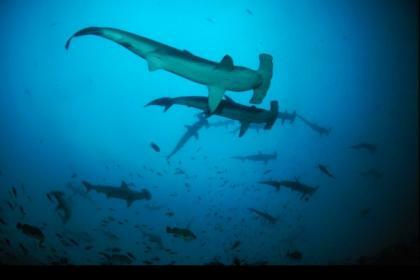 From time to time the Malpelo trips may be combined with a 1 or 2 days visit to the Coiba islands. The expedition begins and ends in Puerto Mutis a sleepy fishing village on the Panamanian Pacific coast. Bus transfers from Panama City to Puerto Mutis and back are included. 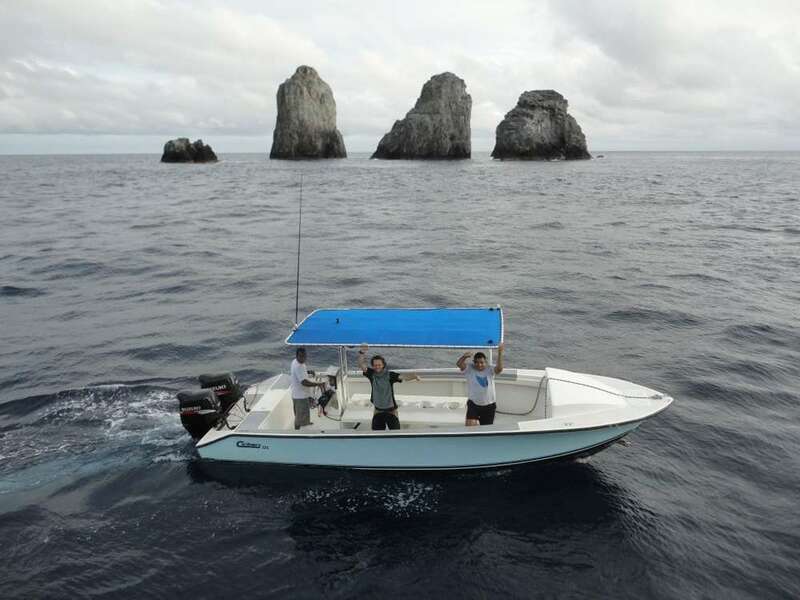 A professional crew and 2 Fiberglas dive skiffs equipped with GPS, fishfinder and powered by 2 115 HP outboarders provide an excellent diving adventure in the east pacific. Nitrox is available at an additional cost. The Peruvian chef Nestor provides an excellent culinaric experience. Type: 2- engines steel ship.Length / Width / Depth: 35m / 7m / 3m. Engines : Twin Detroit Diesel 16V71 HP : 1300. Water capacity: 15.150 liters, 2 x 1 x 7570 liter water purifier y 1 x 4550 liter per hour. Navigation: Radar with chart plotter FURUNO RDP149, Depth Sounder FURUNO FCV 582 , Autopilot SIMRAD AP 50 , computer with Nautical Charts and Software TSUNAMI. 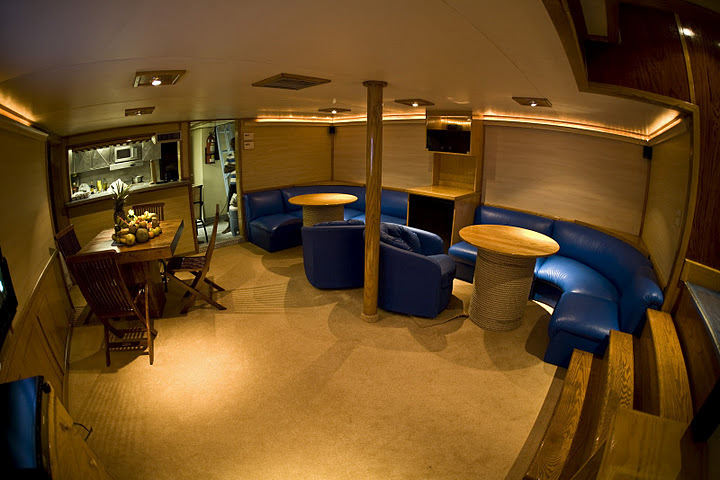 Facilities : Main salon with flat screen TV, DVDs, games, the upper deck offers plenty of space to enjoy the sun, cooler with soft drinks, refrigerator with ice, beer and wine, round the clock coffee, tea, drinking water. Accommodation: 8 cabins (2 master cabins , 2 cabins with private bath , 4 cabins with shared bathroom ) a maximum of 16 guests. 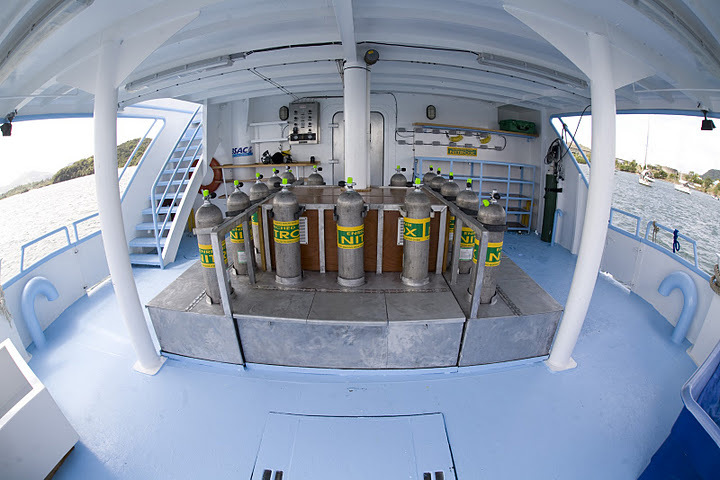 There are 3 cabin types available, all twin cabins divided into 8 cabins accommodating a maximum of 16 divers. Master cabin, cabin with private bathroom and cabin with shared bathroom. 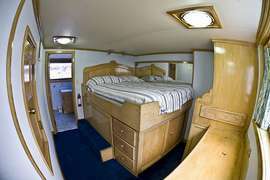 The Master Cabin 1 is port side in the middle deck and has over a king size bed, spacious bathroom , TV , exterior windows and charger 110 volts. The most luxurious solution for a couple. The Master Cabin 2 is starboard side in the middle deck and has a full size and a queen bed, so this cabin is suitable for couples as well as for individuals. Of course, with private bathroom. 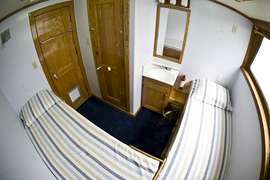 Provides all rooms of the most space for divers who share the same space but want to sleep separately. 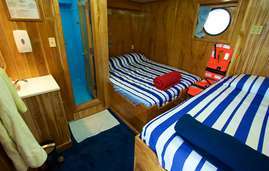 On board available are 2 Standard Cabins with private bathroom, containing lavabo and shower. 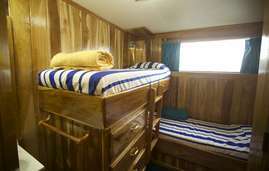 The cabins are bunk style, with two separated single beds. The rooms are equipped with large picture windows providing natural lighting and ocean view. There are four Standard Cabins with shared bathroom on board. Each cabin with a full size and a queen size bed, so the cabin is suited for individuals and couples alike. As all the standard cabins, they have large picture windows for natural lighting and ocean viewing. Two cabins share one bathroom with shower and head. MV Yemaya 2 departs from Puerto Mutis a fishermens village on the panama Pacific coast 3 hours and half from Panama City or from Panama City. The bus transfer Panama city - Puerto Mutis - Panama City is included. Rates in US Dollars per person, availabilities change daily, please contact for updated information.